Choices, choices! Our Roman shades offer a huge variety of ways to customize your window treatments, with 6 styles, 400+ materials, linings, and decorative borders available. To help with your decision making process, we’ll explain where you can find several different material types by referring to the categories on our Swatches page. Solid materials on Roman shades make a clean, elegant statement on your windows. There are multiple fabric types available in solid colors in the following categories: Cotton, Linen, Silk, Wool and Linen Blends, and Velvet. There are even solid colors in our Designer fabrics, from Jonathan Adler and Echo Designs. Linings are available with all types of materials, and Privacy and Blackout linings are free with Roman Shades. 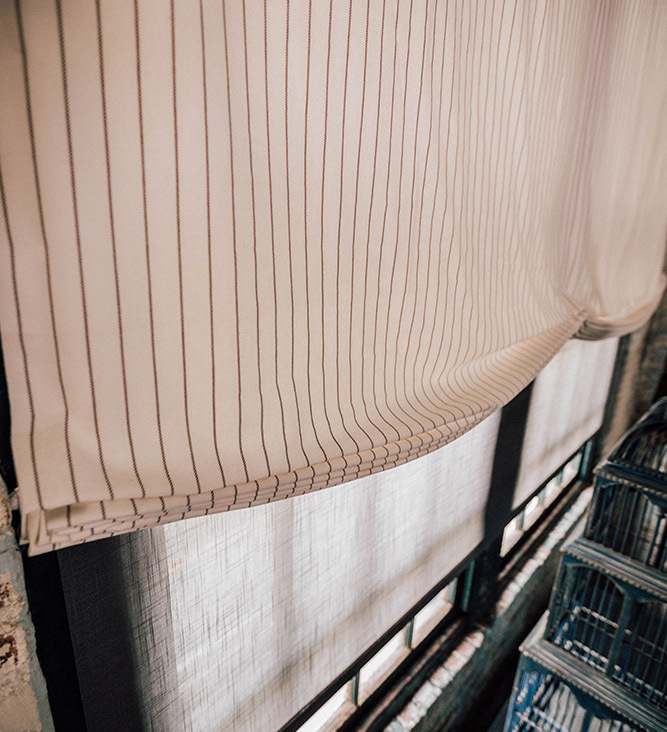 These linings can help block light, heat, and control glare in your home. If you’re aiming for a bright, light-filtering look, a solid sheer fabric like the Sheer Elegance in Silver shown in the photo above is an excellent choice. For a textured, non-fabric look in calming colors, our Naturals collection includes several solids sourced from eco-friendly materials. Solid fabric Roman shades work well in all types of rooms, but especially if your furniture or rugs already have a strong pattern. The fabric of your shades can either blend in with your wall color or pick up on a color present in the rest of the room. Patterns don’t always have to be bold and loud; we carry many subtle patterns that fit in with modern and traditional home décor alike. For example DwellStudio’s Gate Stitch material, The Novogratz’s Geo Arrow, and Robert Allen’s Winding Leaves all have patterns in soft grays and whites that add an understated ornamentation to your shades. If bright colors are more your style, we have plenty of fabrics for you, too. From flowers to tigers to zebra print, our Patterns and Designers collections are full of eye-catching designs in vivid colors. Cotton, linen, silk, and wool fabrics also have several patterned options. 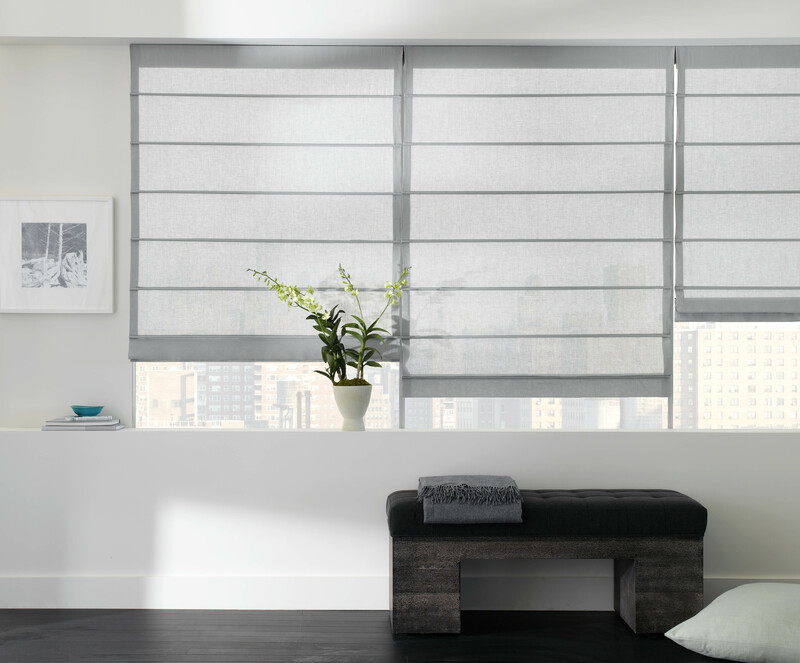 When choosing patterned fabric for your shades, consider how the room will look when the light filters through them. You may want to add a lining to both protect the fabric from fading and give your window treatment a more substantial, opaque appearance. Always classic, stripes are very versatile for Roman shades: the Suit Stripe pictured above can lend a masculine feel to a room, while a narrower Cottage Stripe material in Lipstick Pink would be perfect in a little girl’s room. We have a complete category for Stripes + Plaids, and you can find chevrons and other line patterns in the Geometrics section. Whether you need formal velvet shades for a sitting room or crisp linen window treatments for a beach house, we’ll help you create the perfect Roman shade for your space. To see these beautiful materials in person and test them in your home with your room design, order your free swatches today. Shipping is free, you can order as many as you like, and they’ll arrive in 1-3 days.